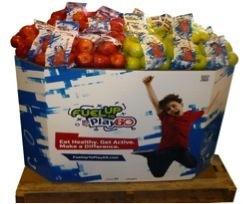 Yakima, WA - Borton Fruit has teamed with several other Washington Apple Industry leaders to join the exciting Fuel Up To Play 60 Program this season. The National Dairy Council (NDC) and NFL collaborated with the United Sates Dept. of Agriculture to create the Fuel Up To Play 60 Program. This is an in-school program encouraging youth to consume low-fat and fat-free dairy, fruits, vegetables and whole grains while also achieving 60 minutes of daily physical activity. Considering the obesity challenges faced today in children and adolescents, the Fuel Up to Play 60 Program has taken initiative by informing children of healthy lifestyle habits at the most optimal time of their lives. "Imagine the impact this will have in communities across the United States. If we can encourage our children to take action for their own health starting in schools, it could have a great effect on long-term healthy choices for the entire family. We are proud to be a part of a program that can truly change the outcome of a child’s health." States Eric Borton, VP of International Sales & Marketing. We are currently promoting a Healthy Eating Breakfast Challenge which began October 1st and runs through December. This has been a very exciting time to roll out with this program considering we have new crop fruit, a new school year has begun, and the NFL season has kicked-off!